Before I leave my Tuscan state of mind, I want to capture a recipe. This is simple and that’s partly why I love it. Last night, Nadia, the owner of the farm, finally let me join her in the kitchen. She offers dinner to the guests about every other night and this was to be an off night, but she was planning to make a little dinner for the wine-bottling crew and offered to feed us as well. 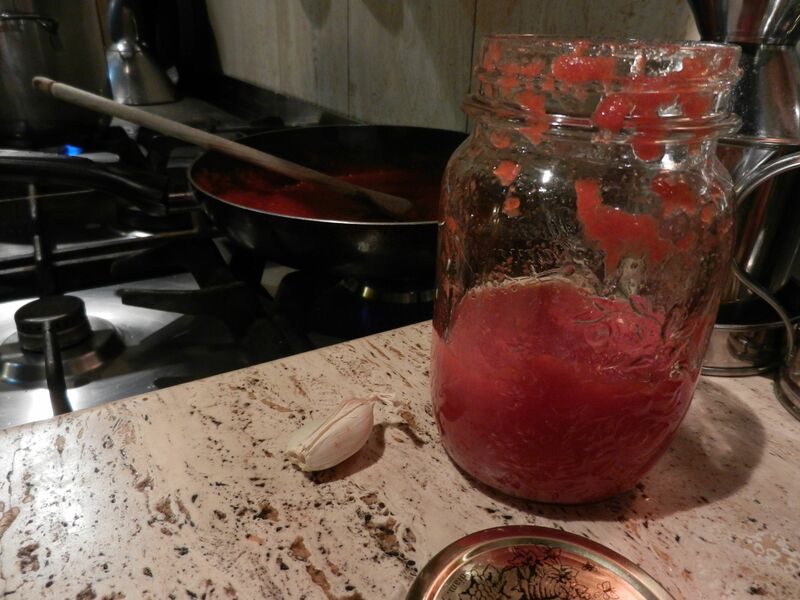 We made a basic tomato sauce from two of the 500 jars of tomatoes they put away each summer. Tomato puree, a clove or two of whole garlic, and a sprinkling of salt were all we used. While that sauce was simmering and the penne was boiling, Nadia whipped up some coconut biscuits. This is a recipe she knows by heart. She began by propping a hand mixer in a bowl in the sink to whip one egg. The rest of the recipe she measured, using her metric scale. To the egg, she added 85 g. (6 Tbsp.) of sugar and beat until light yellow. Then, she mixed in 85 grams (6 Tbsp.) of unsweetened, shredded coconut and finally, 20 grams (1 1/2 Tbsp.) of flour. She simply scooped this out of the bowl in 1 tablespoon scoops, rolled them in her hand and placed them on a baking sheet. This recipe makes 12-14 biscuits. She put them in a 140 degree C. (300 F) oven and while they were baking, melted 100 g. (3.5 oz) of dark chocolate in a double boiler. When the cookies were slightly brown (check after 10 minutes) she removed them from the oven and cooled them by putting them on the terrace. 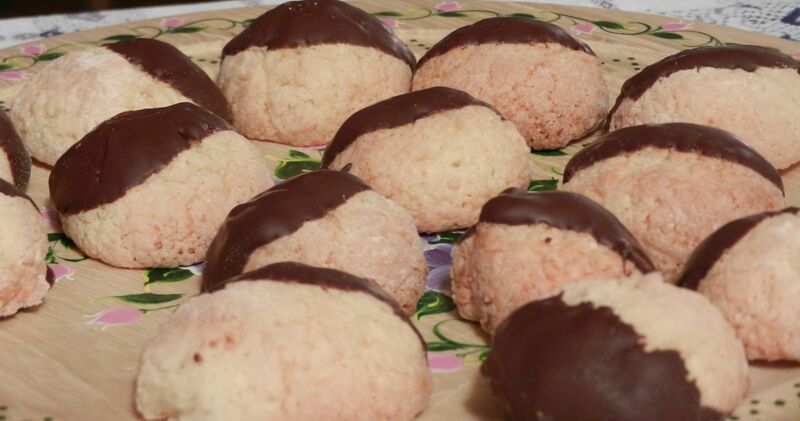 Finally, she half-dipped each cookie in the chocolate and cooled again. This is a recipe I want to pull out for one of those meals when we have company or family with us. Maybe we’ve had a busy day and we are tired, but I still want to prepare a great dinner with a sweet treat at the end. This was the way last night was. It was a big day for Nadia and Renato, getting the bottling in-process. Renato was poetic at dinner about the roller coaster ride a wine maker’s emotions go through in the production of a vintage. 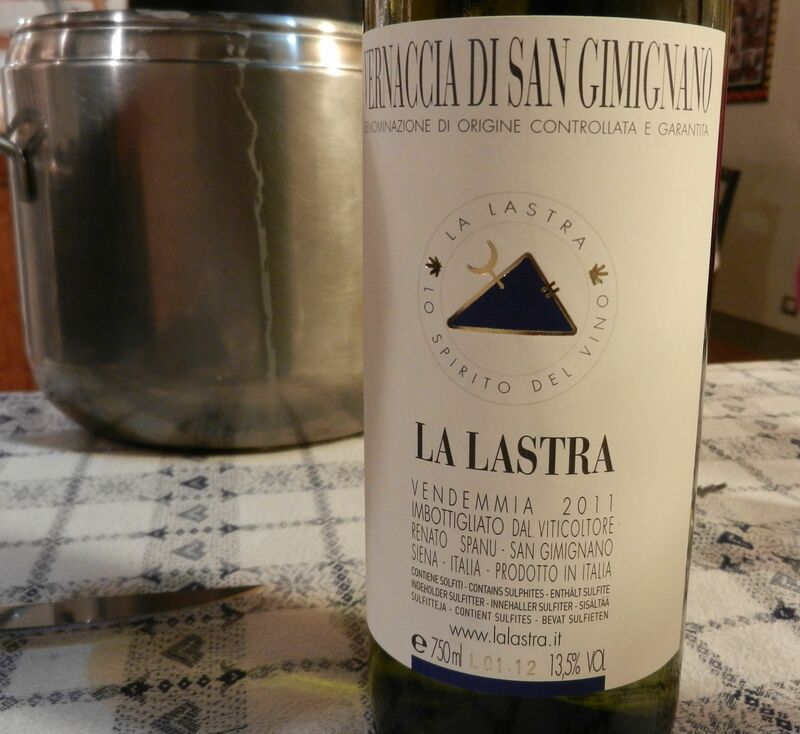 We called this bottle ‘the baby’ and shared the first bottled glasses with the vintner. It was an honor to be in that moment. This is a PS for me. I want to remember to make a cracker-thin crusted pizza with blue cheese and radicchio when I can and I want to keep that idea, somewhere.